The Alpha Quick Fit Sign combines a steel frame with replaceable plastic sign faces in standard chapter 8 including 750mm, 600mm Circles, 750 and 600mm Triangle, 1050 x 750mm, 1050 x 450mm and 600 x 450mm Rectangles and supplementary plates for 600mm and 750mm Triangles. The sign faces are drilled and attached to the frame using a quick fit type attachment. The sign face can be produced in class 1 or class 2 Reflective Material to meet EN 12899:2007. 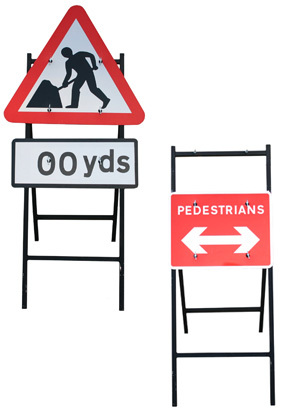 The sign faces are quick to replace and the versatile multi use sign frame is the only one you need to hold in stock. Download the Alpha Quick Fit Sign PDF. For further information on Alpha Quick Fit Signs, please contact us.